The Egschisee serves as a reservoir for the Zervreila power plant and in the early summer it is emptied for maintenance. The artist used the lakebed as a natural mold, digging a roughly 13 x 10 x 1 m hole with a shovel excavator which was then reinforced and filled with light concrete. 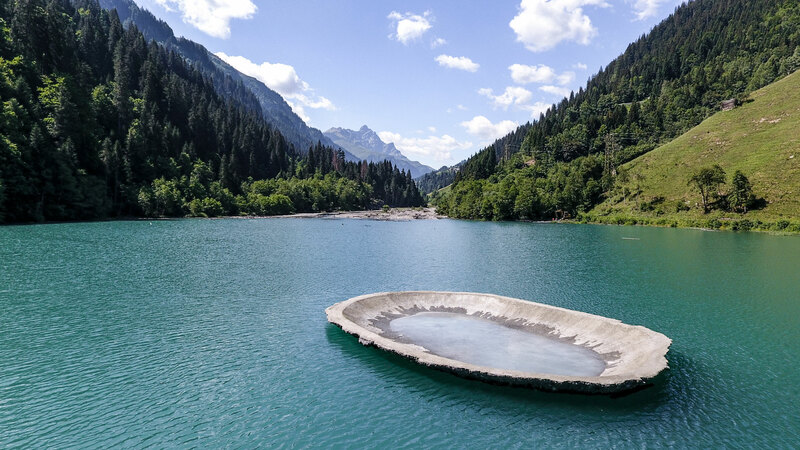 After a three weeks drying phase, the approximately 20-ton shell was driven to the surface by the force of the water returning from the Rabiusa River and since then it has floated as a usable island object in the Egschisee. The sculpture is secured with a long rope to the bottom of the lake and constantly changes location. Visit at your own risk. Max 4 persons.